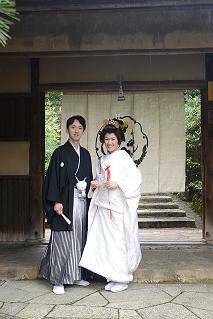 I went to support the wedding reception at Kodaiji DOI after the wedding ceremony at Kamigamo shrine. We were all worried if their guests would come to the wedding because of the typhoon, but they all attended to the wedding. 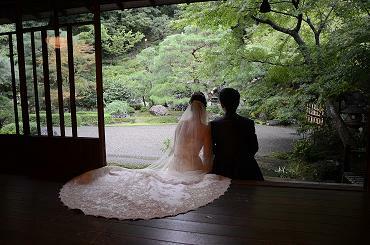 We were also worried about the weather, but when the bride and groom walk down to the HONDEN, and when their guests arrived, and when they photographed at the garden of Kodaiji DOI, the rain had stopped. 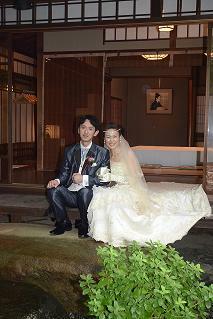 Also, the bride dressed in mermaid-style dress was so beautiful, that all of the staff was fascinated. After they changed their outfits to western wedding dress and tuxedo, I have told to the bride “The dress suits you and you are beautiful! !”, and the groom has answered “I know she is!”, the word made me very happy. When we first met was on November of last year, I could remember the arrangements until the wedding day, that it was very fun and we have laughed a lot. The bride who has brilliant smile which healed me everytime I see her smile. The broom who always hear bride’s opion with broad heart, that I was very happy whenever we met and talk with him in many subjects. 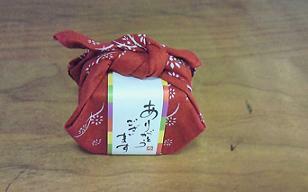 I am very glad that I had such special meeting. 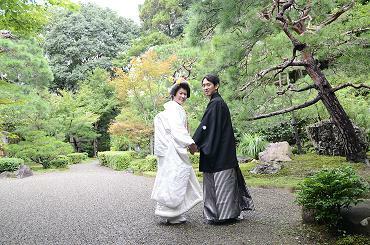 We could not see often like once we had, but I hope your happiness forever.